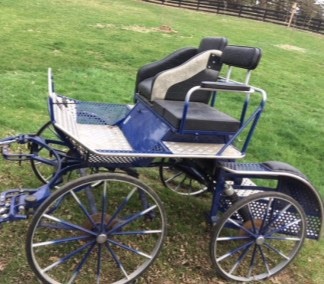 Lessing Marathon 4 wheel carriage for a single horse or a pair. A very stable carriage that follows directly in it’s own tracks. Steel wheels with hard rubber tires. Weighs about 494 lbs. Driver’s wedge & passenger seat. Passenger seat flips up with storage under it. Roomy navigator platform and soft cushioned pads over wheel wells. 125cm track width Removable and adjustable stainless steel shafts, front and rear disc brakes, independent suspension , plus pole and single shafts. Stored inside.